HOT TOPIC OF THE MONTH: "Screening of the Jamie Kastner's 'THERE ARE NO FAKES' documentary on April 29th and May 1st, 2019"
"My art speaks and will continue to speak, transcending barriers of nationality, language and other forces that may be divisive, fortifying the greatness of the spirit that has always been the foundation of the Ojibwa people." Norval, with his incredible ability with the formal problems of art (colour-design-space) and his commitment to the world of his people, the great Ojibway, give one the sense of power that only genius provides... It is sufficient to say that in the history of Canadian Painting, few have, and will remain giants. Norval shall." ~ "An Unofficial Website of Norval Morrisseau"
~ "Ojibwe: WAASA-INAABIDAA 'We Look In All Directions'"
~ "Dancing To Eagle Spirit Society"
~ "The Great Spirit Circle Trail"
1. Who is Norval Morrisseau? 2. Who is widely regarded as one of the foremost experts in Canadian 'Woodland Art'? 3. Who is the Norval Morrisseau Estate? 4. Is information about Norval Morrisseau on Wikipedia reliable? 5. Is information about Norval Morrisseau on FACEBOOK reliable? 6. Who is the Norval Morrisseau Heritage Society? 7. Who is a Blog Master of the Norval Morrisseau Blog? 8. Has the Norval Morrisseau Heritage Society ever answered an open letter written to them by Blog Master Ugo Matulic who expressed concern about authenticity issues regarding Norval Morrisseau paintings? 9. 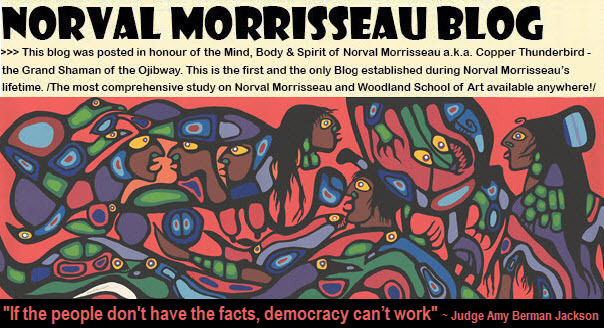 Have any Canadian universities ever been referencing Norval Morrisseau Blog as a part of their 'Educational Resources' links? 10. Has any Native Canadian owned & operated website ever been referencing Norval Morrisseau Blog as a part of their 'Native Cultural Resources' links? 11. Have any Canadian Museums ever been referencing a website dedicated to Norval Morrisseau as a part of their 'Teacher Resources' links? 12. Have any prominent Canadian artists ever endorsed the activities on this platform? 13. Have any internationally recognized Woodland artists ever endorsed the activities on this platform? 14. Have any art promoters ever endorsed the activities on this platform? 15. Have any of Norval Morrisseau's family members ever endorsed the activities on this platform? 16. Have any of Norval Morrisseau's friends ever endorsed the activities on this platform? 17. Have any of Norval Morrisseau's very close friends ever endorsed the activities on this platform? 18. Has any Norval Morrisseau art collector ever endorsed the activities on this platform? 19. Have any Blog Master's friends ever endorsed the activities on this platform? 20. Why did Principal Morrisseau dealer Kinsman Robinson Galleries launched $1,000,000 SLAPP suit against Norval Morrisseau Blog Master Ugo Matulic and what is the outcome of this court case? 21. Has Principal Morrisseau dealer Kinsman Robinson Galleries ever purchased and appraised genuine Norval Morrisseau paintings signed by the artist with black paint with dry brush (DB) technique? 22. Has Principal Morrisseau dealer Coghlan Art Studio & Gallery ever purchased genuine Norval Morrisseau paintings which were authenticated and signed by the artist with black paint with dry brush (DB) technique? 23. Who is an individual who single-handedly caused the greatest harm to the Norval Morrisseau Art Market and whose name is infamously connected with the Legacy of Norval Morrisseau - recently supported by Donald C. Robinson of Kinsman Robinson Galleries in a court case Otavnik Vs Sinclair SC 09-00082782-0000? 24. Has forensic science ever been employed in analyzing genuine Norval Morrisseau paintings which were signed by the artist with black paint with a dry brush (DB) technique? 25. What is the first court case ever to expose all the players involved in the never-ending saga of authenticity of Norval Morrisseau artworks signed by the artist with black paint with a dry brush (DB) technique? 26. Which is the first court court case ever to use forensic science to prove authenticity of Norval Morrisseau artworks signed by the artist with black paint with a dry brush (DB) technique? 27. Which is a pivotal court case relevant to cultural property donation program involving as a key individuals Mr. Joseph McLeod of Maslak McLeod Gallery and Mr. Donald Robinson of Kinsman Robinson Galleries? 28. Which is the court case that exposed serial journalistic incompetence as the main tool harnessed by those who attack the painting legacy of Norval Morrisseau, and in the process – together – grievously undermine and devalue the legitimate Aboriginal cultural heritage of Canada? 29. Which is a pivotal court case relevant to authenticity of Norval Morrisseau artworks signed by the artist with black paint with a dry brush (DB) technique? 30. Which is the first Norval Morrisseau painting "ever to be authenticated BEYOND 'DNA' CERTAINTY"? 31. Which are the most significant of the currently active court cases relevant to authenticity of Norval Morrisseau artworks signed by the artist with black paint with a dry brush (DB) technique? 32. How did Norval Morrisseau inscribe and sign his artworks? 33. Has anyone witnessed Norval Morrisseau signing the paintings with black paint with a dry brush (DB) technique? 34. Has any owner of the reputable gallery ever witnessed Norval Morrisseau signing the paintings with black paint with a dry brush (DB) technique? 35. Has Norval Morrisseau ever authenticated paintings proven to be signed by him with black paint with a dry brush (DB) technique? 36. Is there a video footage in existence showing Norval Morrisseau authenticating paintings signed by him with black paint with a dry brush (DB) technique? 37. Has any prominent Woodland artist (family member) ever authenticated or appraised genuine Norval Morrisseau paintings signed by the artist with black paint with a dry brush (DB) technique? 38. Have any genuine Norval Morrisseau paintings signed by the artist with black paint with a dry brush (DB) technique have ever been offered for sale at Auction Houses, Commercial Art Galleries or exhibited in Museums? 39. Has any Canadian museum ever endorsed and/or authenticated genuine Norval Morrisseau paintings signed by the artist with black paint with a dry brush (DB) technique? 40. Has any genuine Norval Morrisseau painting signed by the artist with black paint with a dry brush (DB) technique ever been part of the Smithsonian Institution? 41. Have any of Norval Morrisseau's patrons, friends and/or collectors ever authenticated and/or appraised any genuine Norval Morrisseau paintings signed by the artist with black paint with a dry brush (DB) technique? 42. Are Norval Morrisseau Declarations A Hoax? 43. When and why it all started: "Norval Morrisseau Conspiracy & Art Market Competition?" 44. What is the opinion of the foremost expert in Canadian 'Woodland Art' (Mr. Joseph McLeod of Maslak McLeod Gallery) regarding the issues in Norval Morrisseau Art Market and reasons behind formation of the Norval Morrisseau Heritage Society? 45. Have RCMP & Thunder Bay Police Service ever done an investigation in regards to any artwork(s) done by or attributed to Norval Morrisseau? "ALL THE INFORMATION PRESENTED ON THIS PLATFORM FROM ITS INCEPTION IS BASED ON DATA COLLECTED FROM THE PUBLIC DOMAIN AND OTHER VERIFIABLE SOURCES." Disclaimer: NORVAL MORRISSEAU BLOG's content is for informational/educational purposes ONLY! * The opinions expressed on the NORVAL MORRISSEAU BLOG are those of the Blog Master, and no other person. * As per decision of the Supreme Court of Canada (December 22, 2009), journalists and other media, including bloggers, will be protected from lawsuits if they diligently try to verify information on matters that are in the public interest (click HERE for more information). * The Canadian Copyright Act, Section 29 reports on fairdealing, that it is not an infringement to reproduce someone else's work for criticism and review, news reporting, and private study or research (click HERE for additional information). * All content sources, be they artists, printed references, and website URL's are respectfully identified on this blog. Writings on these pages could be removed on request of the stated author(s) only. This statement also applies to the posted digital images and/or photographs of the copyrighted material. * This blog has no control over the information you access via outbound link(s) in the post text, sidebar, footer or comment sections. This blog does not endorse linked website(s), cannot guarantee the accuracy of any information found by following said links or the correctness of any analysis found therein and should not be held responsible for it or the consequences of a user’s use of that information. If you are curious about the veracity of something you find, please consult the appropriate experts. * Blog Master will not be liable in any way for comments posted on this site, and by using this site, you acknowledge and agree that sensibilities vary among people and that you may be exposed to comments you find offensive or otherwise objectionable. Comments herein are the sole responsibility of their writers and the writer will take full responsibility, liability, and blame for any libel or litigation that results from something written in or as a direct result of something written in a comment. The accuracy, completeness, veracity, honesty, exactitude, factuality and politeness of comments are not guaranteed. All original text is the intellectual property of Ugo Matulic of Calgary, Alberta CANADA. * All text and images are protected under Canadian and international copyright law, and may not be copied, reproduced, transferred, or transmitted, in any way at all, in whole or in part, without the prior written approval of Ugo Matulic at ugo.matulic@norvalmorrisseau.com.